Killer Beaz is fresh from the television screen to the stage in the Rocket City, performing at StandUp LIVE Thursday through Saturday, February 21-23, 2019. Beaz is currently guest starring in his third season of the Discovery Channel’s hit series, “Moonshiners”, touring the country, performing on the high seas, and about to release an upcoming DVD series of clean comedy, “Killer Beaz PRESENTS” featuring the standup of Beaz and outstanding comics handpicked from all over the country. Beaz delivers a high-energy, edgy, and “everyman” style humor that appeals to any audience. See him on television, hear him on the radio, see his stage performance live...you'll be "Stung for Life!" 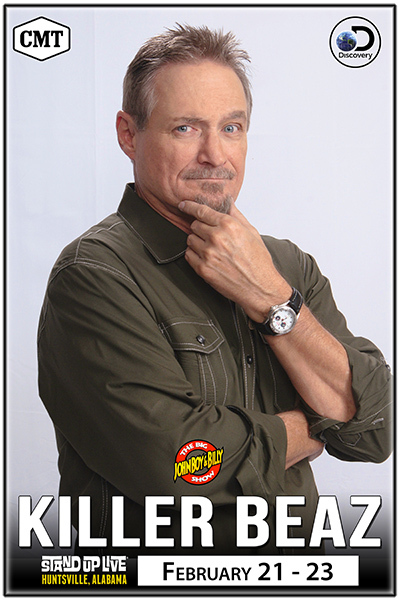 Killer Beaz is a favorite guest of several nationally syndicated radio shows, Beaz entertains millions of his fans on a regular basis. USA Today says he is a “Star rising in the South!” He’s made numerous appearances on The Discovery Channel, Showtime, Entertainment Tonight, Comedy Central, E!, A&E, CNN, ESPN, CMT, GAC. He has also been featured on radio shows such as Bob & Tom, John Boy & Billy, Rick & Bubba, Bob & Sheri, Big D and Bubba, WTF with Marc Maron, Taste of Country Nights, SIRIUSXM Blue Collar Radio, iHeart Radio, SIRIUSXM Comedy Channels and SIRIUSXM NASCAR Radio.